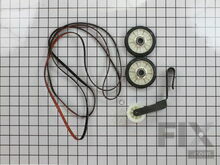 This is a rear drum support roller kit for your dryer. The 2 rollers come with 4 tri-rings, and 1 palnut. We recommend that you replace both rollers at once. This kit stabilizes the drum cylinder, allowing the dryer to tumble properly. If you are having problems with your appliance during tumble mode, or if it is too noisy, you will need this kit. Part Number 349241T replaces: 26000349241, 337089, 3389901, 3397588, 3397590, 340352, 3436, 349241, 349241T, 349241TVP, 661562, 8170, 8205, 99989678, 99989679, AP3098345. 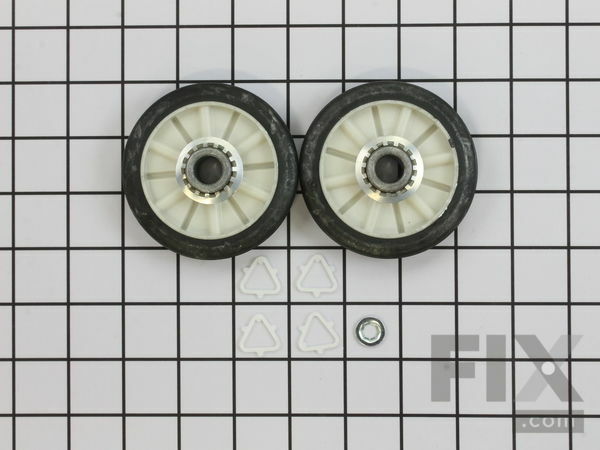 The roller support wheels were worn down and needed replacing. Step 1: removed power source. Step 2: removed screws from lent catcher. Step 3: removed top lid. Step 4: removed front panel. Step 6: removed plastic washers. Step 7: removed old wheels. Step 8: installed new wheels. Reversed steps to put everything back. The dryer squeeled the full time it was turned on. Rubber on support roller was breaking and rubbing off. Replaced belt while in there. Pulled belt off rollers removed drum from dryer then replaced. Removed bad roller. Hardest part was getting the triangle past the first groove to the second. Cleaned shaft with towel and greased with lithium then put roller and second triangle on. Put drum back in and hook belt back on. I watched a video on you tube that showed step by step. Unplugged appliance, lifted dryer lid, took front off, relpaced rollers, belt, idler arm.The dryer is much quieter running. There was a thumping sound as the dryer drum went around. The center of one wheel was worn to an oval. Replaced both drum support wheels. I replaced the drum rollers, belt and idler pulley, I had an 80-90% chance that it would fix the issue. The video on the website was spot on in every phase of the repair - just follow it as shown. By spending $45, I bet I'll get many more years out of this machine. Repair was made so easy with the video! I found the repair video on youtube first and ordered the parts from partselect. The parts arrived very quickly. I watched the video again to make sure I knew what I was doing, took the dryer apart, and had the new rollers installed, dryer put back together, and clothes drying in about half an hour. Thanks so much!